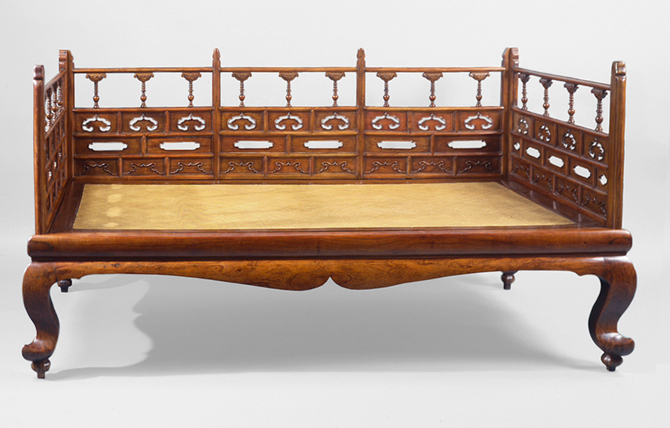 We consider this high-rail couch bed to be one of the most significant and unusual pieces of Chinese furniture ever discovered. It is remarkable not only for its spectacular form but also a design closely associated with early Chinese architecture. Dr. Sarah Handler discusses this Couchbed with a brilliant commentary in Ming Furniture In The Light Of Chinese Architecture, pages 86 to 88. She writes as follows: “The couchbed, or ta, has railings on three sides and, thus, resembles a Western-style couch except that it is much deeper. It is illustrated and labeled ta in the 1609 Sancai tuhui (Pictorial Encyclopedia of Heaven, Earth, and Man). Contemporary Beijing cabinet-makers refer to the couchbed as a luohan bed, or luohanchuang. Couchbeds were a standard item of furniture in the study, the women’s bedroom, and were also used in the main hall. 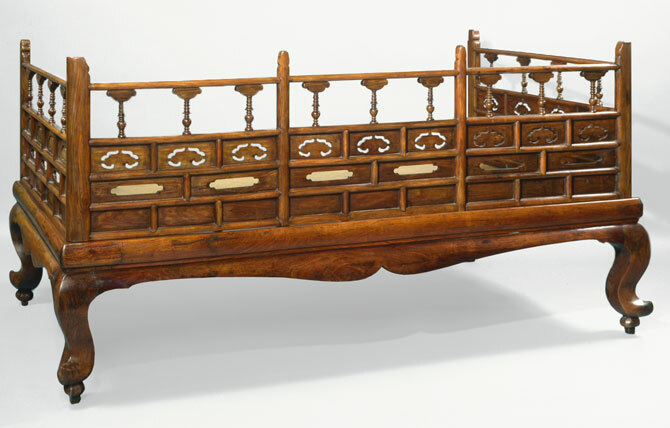 This couchbed is possibly unique among extant hardwood pieces because of its high ornamental railing. The elaborateness of this feature is balanced by the solidity of the base and the powerful cabriole legs. The feet do not rest flatly on the floor, but are elevated on balls and posts, creating a sense of lightness despite the massiveness of the piece. The bold, sweeping curve of the legs is continued by the apron, which is made from a one-and-a half-inch thick piece of beautifully grained wood, and the smoothly rounded edge of the seat frame. Marks at the outer corners of the seat frame indicate that at one time metal mounts were added for decoration or reinforcement. As is usual with Chinese beds that have not been altered, there is a soft mat seat providing a comfortably firm yet yielding surface. The mat is strung in a removable frame (in this example made of elm) to make it easier to replace. The railings consist of panels arranged in horizontal bands, with proportions and motifs carefully crafted to suit the spaces. Starting with solid panels at the bottom, the railings become more and more open and dynamic culminating in a row of stylized lotus. The lotus, which grows in stagnant muddy waters, is a favorite decorative motif associated with purity, integrity, Buddhism, summer, and fecundity. The railings’ lotuses rise above a row of cloud-heads (implying immortality and wish fulfillment) with a row of begonia-shaped cartouches below. Lotuses also decorate the carved wooden beams in some of the Ming houses in Anhui. In Wu Xihi’s house, for instance, short struts in the rafters rest on lotuses. The bed’s railings bear a striking similarity to carved wooden panels in the Anhui homes built in the fifteenth and sixteenth centuries for minor officials and prosperous merchants enriched by the salt monopoly in Huizhou (modern Shexian).